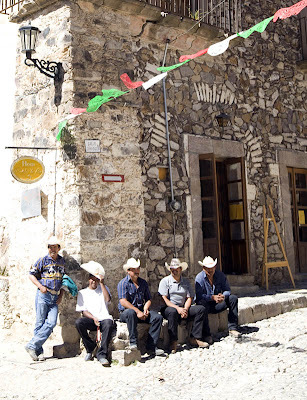 The men in the sombreros could be found late each afternoon sitting on this corner in the silver mining town of Real Catorce, Mexico. I’m not sure if they gathered each day to catch up on the day’s events or if they were waiting for the saloon across the street to open. Like Real Catorce they look like they belong on the movie set of a good, old fashioned Western. Clearly this group, with smiles and white hats, are the good guys. Great Blog! Am linking it up to my page as I write.. Thank you and glad you found your way here. Great shot! Did you catch them at siesta time? It's so stinking hot that step-sitting/wall-leaning is a full time job for many.